There is a new Angry Birds game on the horizon, and this time it'll be the result of an exclusive partnership between Rovio, the makers of the original game, and Hollywood studio 20th Century Fox. The game, named "Angry Birds Rio", will be a crossover of Rovio's series with the upcoming animated film Rio, which -- guess what -- tells the story of two birds, Blu and Jewel, that have to fight animal smugglers in Rio de Janeiro. The new Angry Birds game will follow a plot similar to the movie: the original Angry Birds are kidnapped and taken to Rio de Janeiro, but they manage to escape and set out to save Blu and Jewel, the characters of the movie. Sounds like Rovio and 20th Century Fox really collaborated to make the series fit together -- how couldn't they, considering we're talking about a blockbuster game and a new film from the creators of the Ice Age trilogy? 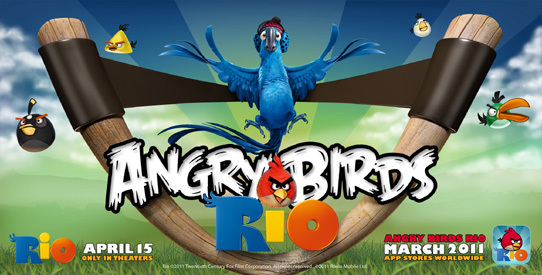 Angry Birds Rio will launch in March 2011 with 45 initial levels, and more will be added with software updates. The app will be released for "smartphone and tablets" -- we guess iPhone and iPad support is pretty much obvious. No word on pricing yet, but we think $4.99 is the usual sweet spot. Full press release available here, and trailers of the movie and game embedded below.